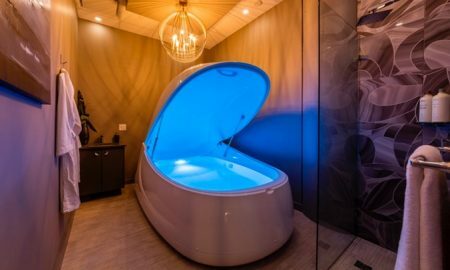 Float pods offer the feeling of weightlessness as guests can relax and meditate, allowing the body to recover from stress and may ease pain, stimulate blood flow in tissue, and release endorphins. For those with claustrophobia, the more open floatation suites offer a spacious alternative, where guests receive their own room or share the experience with a partner, controlling the lighting while lying under twinkling stars in the ceiling. This is a limited 2-day only sale that will expire at midnight on Monday, February 11, 2019. Promotional value expires 120 days after purchase. Amount paid never expires. Appointment required. Limit 1 per person, may buy 1 additional as gift(s). Valid only for option purchased. Merchant’s standard cancellation policy applies (any fees not to exceed voucher price). Merchant is solely responsible to purchasers for the care and quality of the advertised goods and services. Colon hydrotherapy: The 40-minute treatments infuse colons with warm, filtered water to remove accumulated waste and toxins. Float pod: Clients relax inside a flotation pod that simulates zero gravity, which may alleviate pain and stress while improving circulation. Flotation suite: Those with claustrophobia can opt for flotation therapy in a pool within a spacious private room.